Sokcho city is in Gangwon Province of South Korea. It is located along the coast of East Sea in north east of South Korea. Japan is at the other side of East Sea. Mt. Sorak is a popular tourist attraction nearby Sokcho City. Tourists that pay a visit to Mt Sorak will visit Sokcho city as well if time is permited. 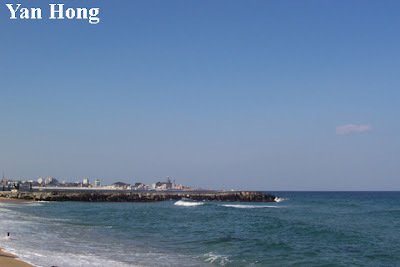 Sokcho City is famous for its beach. 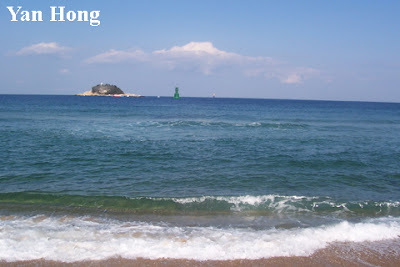 Sokcho Beach is one of the South Korea beach that worth visiting. Its white soft sands and crystal clear water attracts many local and foreign tourists to visit. There are various facilities such as campsites, showering booth, dressing room, parking lots and lodging available for visitors. Sokcho Beach is one of the site for celebrating Haemaji (sunrise greeting) festival on 1st of January of every year. Oh, how it reminds me that I used to go to the beach to swim and have picnics with relatives and friends. I simply miss spending time just at any beach. The beach generally has a calming effect. The water looks very nice. Just love the different shades of blue. Beautiful beaches. I love water, it makes me calm. And now I live near beaches, Florida.